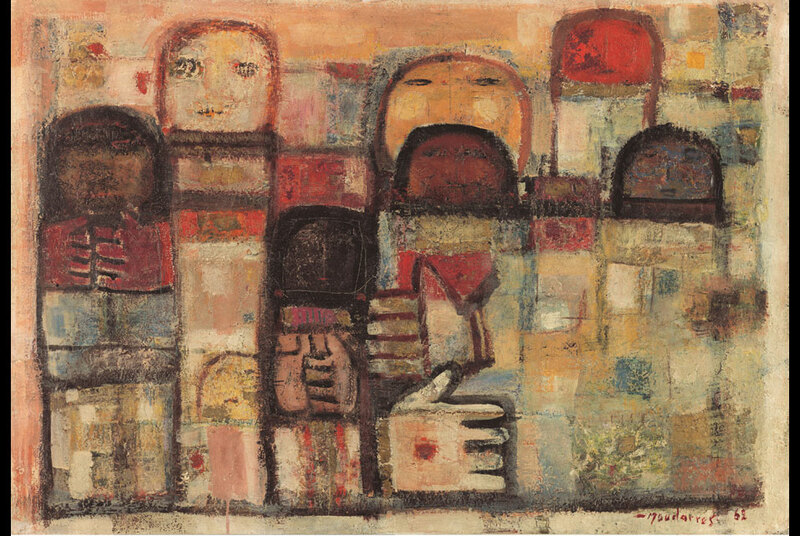 Fateh al-Moudarres, Title Unknown, 1962. Mixed media on canvas, 69.8 x 99.7 cm © Mathaf: Arab Museum of Modern Art. DOHA.- Mathaf: Arab Museum of Modern Art revealed the details of the three exhibitions it will present when it opens to the public on December 30, 2010. Historic works of Arab modernism and a multitude of new works commissioned by Mathaf will be on view at two sites in Doha, Qatar. The new Museum will open its 5,500-square-meter (59,000-square-foot) building with Sajjil: A Century of Modern Art. This will be the first in an ongoing series of exhibitions that will survey Mathafs unparalleled collection of more than 6,000 works representing major trends and sites of production of modern Arab art, spanning the 1840s to the present. Sajjil, an Arabic word meaning the act of recording, will feature paintings and sculptures by more than 100 artists, representing pivotal moments in the development of Arab modernism throughout the 20th century. Sajjil is organized by guest curator and consultant Dr. Nada Shabout, Associate Professor of Art History and Director of the Contemporary Arab and Muslim Cultural Studies Institute at the University of North Texas; Wassan Al-Khudhairi, Mathafs Chief Curator and Acting Director; and Deena Chalabi, Mathafs Head of Strategy. The historical exhibition Sajjil makes its own contribution to rethinking the position of Arab artists toward modernism and within the modernist movement. While making a space for modern art from the Arab world within the wider history of art, Sajjil explores the multiplicity of experiences that form modern art from the Arab world. Organized around themes that overlap and intersect, the exhibition emphasizes the several common moments that justify the discussion of a collective Arab identity, but at the same time acknowledges discontinuity and rupture as part of the story. At a new QMA exhibition space located on the grounds of the Museum of Islamic Art, Mathaf will also present the exhibitions Interventions and Told / Untold / Retold, which will be on view from December 30, 2010 to May 28, 2011. Interventions: a dialogue between the modern and the contemporary, curated by Nada Shabout, will profile five major artists whose careers have spanned the years from modern to contemporary art. They are Dia Azzawi, Farid Belkahia, Ahmed Nawar, Ibrahim el-Salahi and Hassan Sharif. A new work commissioned by Mathaf from each of these artists will be shown in the context of existing works by the artists from the Mathaf collection. The exhibition honors the lives and careers of these artists, who have forged and promoted modern art in their respective countries and remain influential today. Because Arabism was a major factor in the maturation of modern art from the Arab world when they came of age, their work has sometimes manifested a search for cultural identity and a desire to preserve cultural distinctiveness. At the same time, these artists have never sacrificed aesthetic growth, or abandoned the existential quest for understanding the modern self. Told / Untold / Retold: 23 stories of journeys through time and place will present new works commissioned by Mathaf from 23 contemporary artists with roots in the Arab world. The most ambitious museum exhibition of contemporary art ever presented in the Arab world, Told / Untold / Retold will include painting, sculpture, photography, video, multimedia installations and interactive digital art. The participating artists are Adel Abidin, Sadik Kwaish Alfraji, Buthayna Ali, Ahmed Alsoudani, Ghada Amer, Kader Attia, Lara Baladi, Wafaa Bilal, Abdelkader Benchamma, Mounir Fatmi, Lamia Joreige, Amal Kenawy, Jeffar Khaldi, Hassan Khan, Youssef Nabil, Walid Raad, Khalil Rabah, Younès Rahmoun, Steve Sabella, Marwan Sahmarani, Zineb Sedira, Khaled Takreti, and Akram Zaatari. Told / Untold / Retold is curated by Sam Bardouil and Till Fellrath, the co-founders of Art Reoriented, a curatorial platform focusing on contemporary art from the Middle East. Told / Untold / Retold is a collection of 23 stories each vividly expressed in a new art work. Some stories are Told, evoking autobiographical accounts and nostalgia for the things that were. Other stories are Untold, anticipating an imagined future that speaks of things that could be. And there are those that are Retold, proposing an alternative narrative to the things that are. Central to each story is the use of time as a concrete compositional element and the reflection on the act of journeying, a condition that has come to describe the rampant fluidity of todays society. Mathaf is the outgrowth of more than two decades of activity by His Excellency Sheikh Hassan. The collection was adopted originally by Qatar Foundation, which safeguarded it for four years before QMA took on the Museum as a project in partnership with Qatar Foundation. Overseeing the establishment and opening of Mathaf is QMA Chairperson Her Excellency Sheikha Al Mayassa bint Hamad bin Khalifa Al-Thani.